If you like these cartoons, please help me make more by supporting my patreon! A $1 pledge really matters to me. I’m fascinated by cycles, and I’ve done several cartoons before attempting a circular layout. I think it’s worth doing, because it’s important to realize how many things in politics do become self-perpetuating cycles. It’s also (to me) an interesting technical question. 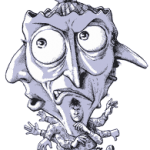 Comics are, by nature, rectangular (or square); magazines pages are rectangular, images for posting on the web are rectangular. So how can a circular cartoon be made to work with a rectangular image area? And what to do with the somewhat awkward center area that usually results from doing pie-slice-shaped panels? And what to do with the empty areas outside the circle? I always find it interesting to try and solve these problems. The issue this cartoon looks at is one that I find immensely frustrating, like virtually all the progressive Democrats I know. The Republican party continually uses the deficit as an excuse to say no progressive legislation can be afforded (and indeed, to argue for making huge cuts); but as soon as they’re in charge, they blow up the deficit with enormous tax cuts and large (often military) expenses. This cartoon is a circle. 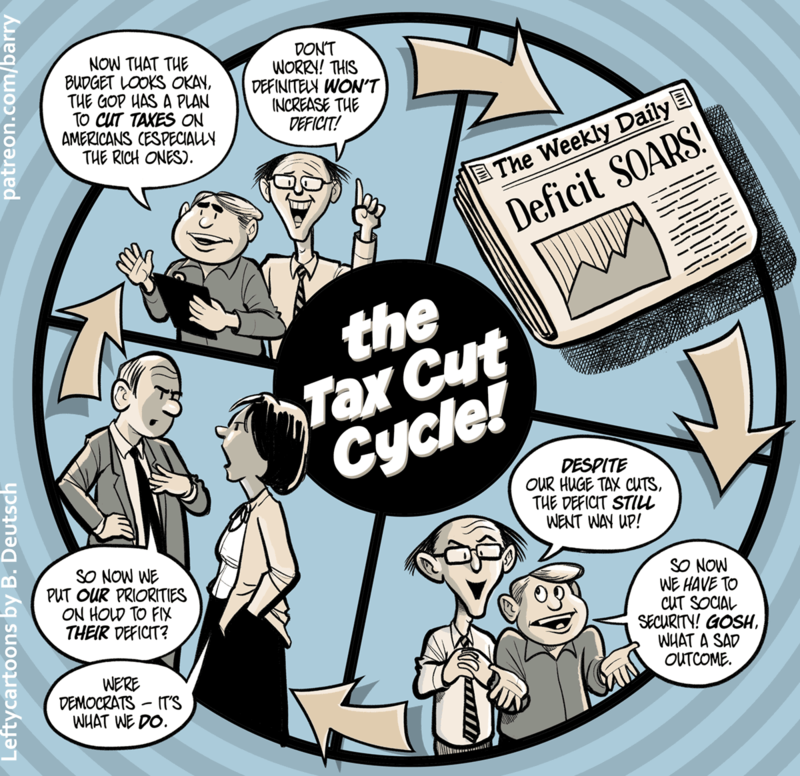 At the center of the circle is the title of the cartoon: “The Tax Cut Cycle.” Four panels are in the circle; arrows indicate that the panels are to be read clockwise. Two men, one in a collared button-up shirt and carrying a clipboard, the other wearing glasses and a necktie, are speaking cheerfully to the reader. CLIPBOARD: Now that the budget looks okay, the GOP has a plan to cut taxes for Americans (especially the rich ones). GLASSES: Don’t worry! This definitely won’t increase the deficit! A newspaper (“The Weekly Daily”) shows the headline “Deficit SOARS.” A graph on the front page of the newspaper shows a trend line heading upward. Clipboard and Glasses – Glasses now looking a great deal more malevolent – are smiling and speaking to the readers. Clipboard is shrugging in a “what ya gonna do?” gesture. GLASSES: Despite our huge tax cuts, the deficit still went way up! CLIPBOARD: So now we have to cut social security! Gosh, what a sad outcome. Two people in business wear, a man and a woman, are talking. They look unhappy. MAN: So now we put our priorities on hold to fix their deficit? WOMAN: We’re Democrats – it’s what we do. An arrow leads clockwise from this panel, back to panel 1, restarting the cycle. I really like this one–the fact that the lines in the circle are somewhat slanted gives it a nicer flow, I think than if they were perfectly vertical and horizontal. The arrows also help. I also think this is one that may actually help speak to the “other side,” since most rank-and-file Republicans do say they care about deficits. We cared about deficits all through the 8 years of unprecedented government spending under Obama… including a totally unwarranted bail out of Wall Street fat cats with taxpayer funds… Gosh, maybe all the “Democrat priorities” implemented during that time have something to do with the deficits we are now facing? Instead of entertaining “maybes,” you could do actual research and find that the deficit fell under the last two Democrat administrations and rose under the last two Republican administrations.